The actor, Sabu, born in India in 1924 and tragically died of a heart attack at the age of 39 in 1963, was a staple in my house growing up. He acted in such films as Black Narcissus (1947), Elephant Boy (1937), The Drum (1938), and The Jungle Book (1942). The film version of Rudyard Kipling’s “The Jungle Book” was especially a big influence on me growing up (we had taped it off AMC in the late 80s) and it’s still a pretty good movie, complete with talking snakes, wild animals, murder, mayhem, and a largely white cast painted brown (typical of the era, you should see the 1937 movie adaptation of Pearl S. Buck’s The Good Earth). 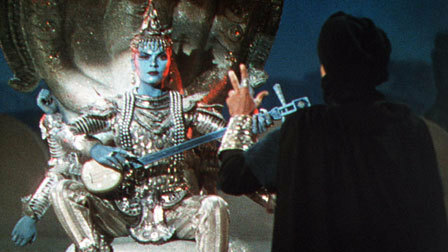 Today I would like to profess my love of my favorite Sabu movie and one of my favorite movies of all time, The Thief of Bagdad (1940). This was one of my favorite movies growing up (again, taped off TNT in the late 80s) and it’s still first class entertainment. This version, directed by Ludwig Berger, Michael Powell, Tim Whelon, Alexander Korda, Zoltan Korda (director of Jungle Book by the way), and William Cameron Menzies, I actually prefer to the great silent era Thief of Bagdad (1924) directed by Raoul Walsh and starring Douglas Fairbanks, Sr. and with Anna May Wong in a supporting role (this version is good too though). 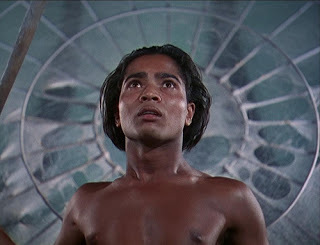 The Thief of Bagdad is a wonderfully colorful movie that starts out as a flashback as the blind Ahmed (John Justin) pets his dog and recounts to a curious harem the tale of a time before he was blind and the dog was a little thief named Abu (Sabu). The story follows the lives of Ahmed and Abu and how they met. When Prince Ahmed’s evil grand vizier, Jaffer (played by the great Conrad Veidt from The Cabinet of Dr. Caligari, The Man Who Laughs, and Casablanca), tricks the naive prince into venturing out among the commoners. There he hears how everyone hates him (although it is really Jaffer who is pulling all the royal strings). Jaffer has Ahmed arrested and thrown into prison. There he meets the mischievous vagabond, Abu. Both sentenced to death, they think of a plan to escape. 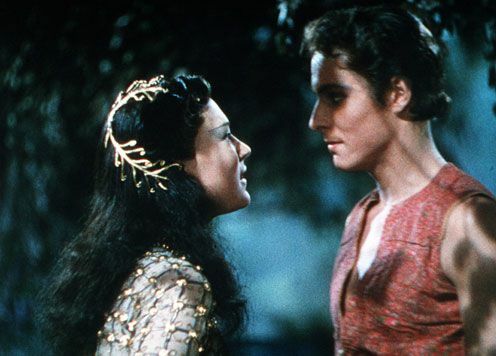 They take a boat to another kingdom where Ahmed falls in love with the Princess (June Duprez) the moment he sees her. Abu wants to take the boat and explore the world with Ahmed, but Ahmed now only wants the Princess. Naturally their friendship suffers some duress. The evil Jaffer is controlling the king (Morton Selton) of this kingdom too (and it’s not too hard when he’s a blithering idiot obsessed with toys). Jaffer seeks to marry the Princess but when Ahmed and Abu prove too troublesome, he curses them both and separates them. Now Ahmed is blind and Abu is a dog. The film suddenly snaps out of its flashback (about halfway through the runtime) and one of the harem girls tells Ahmed she knows the Princess and that she is in an enchanted sleep. From then on Ahmed tries to reach the Princess and regain his sight. After several more chance encounters and motivational misgivings about what’s more important—adventure, the girl, or their friendship—Ahmed and Abu are shipwrecked by an enchanted storm that Jaffer sends after them. The two heroes wash up on separate shores. Here’s where the movie kicks into high gear. Be careful. Djinn not always so friendly. 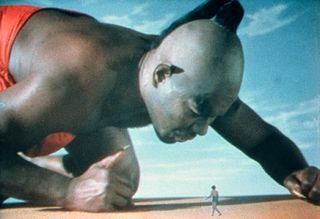 Abu runs along the beach looking for Ahmed and stumbles across a bottle that contains a gigantic djinn (or genie, played with gusto by the great Rex Ingram). With three wishes and a huge, powerful, and somewhat independently-minded magical djinn, Abu sets out for a lost empire to retrieve the All-Seeing Eye from a strange cult of goblin creatures in order to find his friend. The djinn only takes him to the gate and sets the little thief loose inside the temple. Inside Abu discovers true adventure as he battles giant spiders and tries to avoid the giant octopus. Needless to say, Abu succeeds and finds Ahmed. But after a little spat upon the discovery that Jaffer has tricked the Princess into falling in love with him, Ahmed returns to Bagdad, the djinn departs, and Abu is left alone in the wilderness while his friends get arrested and sentenced to death at the hands of Jaffer. But the once side-kick, Abu, is about to become master of the universe in a strange turn of events and he hops a magic carpet back to Bagdad to save the day. The last act of this movie is especially enjoyable. Adventure never tasted so good in my opinion and it all ends well. Aladdin (1992) definitely borrowed a lot from this movie. 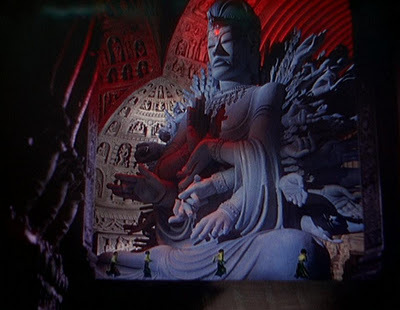 There’s a bit more going on in this movie than what I’ve mentioned and the pioneering special effects, fantastic Technicolor, and the performances of Sabu, Veidt, and Ingram really make Thief of Bagdad something special. Anyone in the mood for a fun adventure in the spirit of the Arabian Nights should look no further. After over 70 years this classic still offers film lovers a wonderful adventure. Magic, flying mechanical horses, djinn, wizards, flying carpets, giant spiders, and this evil blue robot lady with all the arms! Originally published for “The Alternative Chronicle” on July 28, 2009. 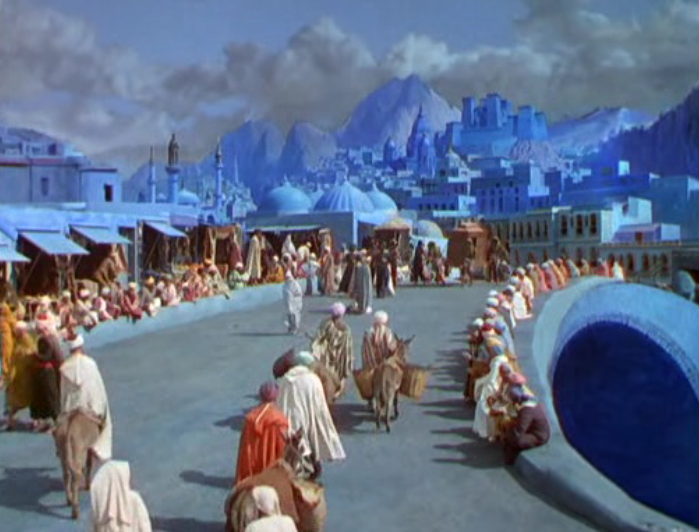 This entry was posted in Classics and tagged 1940, adventure, aladdin, arabian nights, bagdad, cinefile, classic, conrad veidt, djini, fantasy, flying carpet, fun, giant spider, iraq, jaffer, magic, movie, rex ingram, sabu, sorcery, technicolor, thief of bagdad. Bookmark the permalink.